There is nothing like an old fashioned rout to start off a series. That is exactly what the San Diego Padres did tonight, welcoming the Atlanta Braves to Petco Park by blowing them out 11-4 to take the first game of the series. Clayton Richard was excellent again for the Padres, going seven innings while giving up three runs on six hits, striking out five. Richard has pitched at least six innings in his past six starts, dating back to his May 8 start against the Washington Nationals where he pitched eight innings of three-run ball. After a quick 1-2-3 inning from Richard, Julio Teheran was ready to continue his success against the Padres as he carried a three-game winning streak against San Diego. In those three games, he never went up against the new Padres first baseman Eric Hosmer and Hosmer would welcome Teheran to Petco Park by belting a solo home run 433 feet to the deepest part of the ballpark, giving San Diego the early lead. The next inning saw yet another Padre go the distance, as Cory Spangenberg would yank an inside fastball to right field, just clearing the fence for Spangenberg’s second home run in as many day. Teheran would struggle throughout the inning, giving up a single to Raffy Lopez and walking Travis Jankowski and Hosmer. He would get a weak fly ball off the bat of Jose Pirela to put an end to the inning. Richard would continue doing what he does best; induce weak contact. He would cruise through the second and third inning by getting Braves hitters to bounce into weak ground balls that were gobbled up by the San Diego infield. He would even get Dansby Swanson and Johan Camargo to strikeout in the third inning. The Braves would finally push together a couple runs when Nick Markakis and Tyler Flowers would get back-to-back singles off of Richard. Charlie Culberson, who earned a start after hitting a walk-off home run against the Washington Nationals, swatted a 3-1 fastball to right field for a two-RBI double that would tie the game up and give the visitors a little bit of hope. Said hope was immediately crushed one batter into the fourth inning as Lopez, looking like Tiger Woods teeing off during the PGA Tour, pummeled a mistake pitch to deep right field to give the lead right back to the Padres. The floodgates would burst open in the fifth inning, and it all began with a lead off walk to Jose Pirela. It was at this point that Teheran would leave with an apparent injury and Luiz Gohara would be brought in for relief, but Gohara wouldn’t be fooling any San Diego hitter. Renfroe greeted him to the game with a double that would place Pirela on third base and, after a ground ball out to the pitcher, a sacrifice fly from Freddy Galvis would plate Pirela. With two-outs, the Padres wouldn’t let Gohara leave the inning without applying some scorching burns. Spangenberg roped a triple to right field scoring Renfroe, followed by Lopez cracking a single to left field to bring home The cardinal sin of baseball was committed when Richard was walked with a full count. Jankowski would make Gohara repent for his sins by slicing a hanging curveball to right field for a RBI double and Hosmer would get in on the hitting parade with a double of his own, scoring both runners. Pirela would line a base hit to center field and caught the Braves defense snoozing by hustling to second base to turn a single into a double. Peter Moylan would be called to douse the fires and got Renfroe to ground out to end the bleeding. An RBI single by Ender Inciarte would get the Braves one run closer, but the following inning would see Moylan hang a juicy curveball right in the wheelhouse of Franmil Reyes. 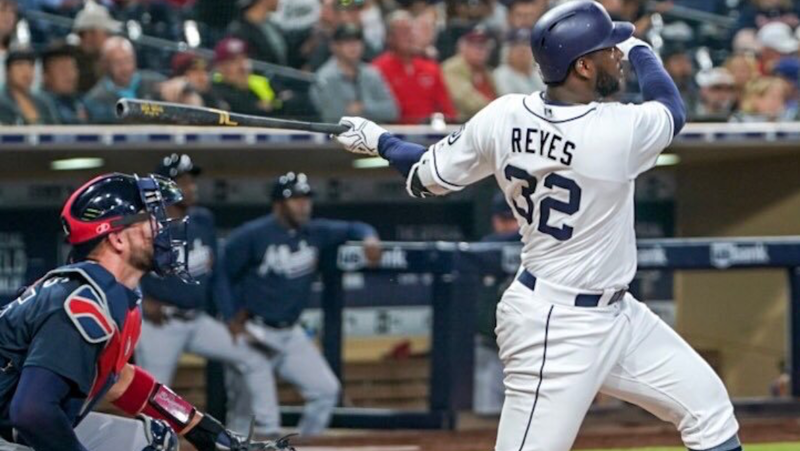 Reyes would punish the innocent baseball by sending it into the left field bleachers and celebrating with Hosmer in the dugout after rounding the bases. After Richard exited the game after seven innings, Matt Strahm would pitch a perfect eighth inning to bridge the gap to Phil Hughes. Hughes would immediately run into trouble by giving up three straight hits and the third hit, a double by Peter Bourjos, would score Culberson to give the Braves their fourth run of the game. Hughes would buckle down after this, striking out Ozzie Albies and Camargo swinging and looking respectively. 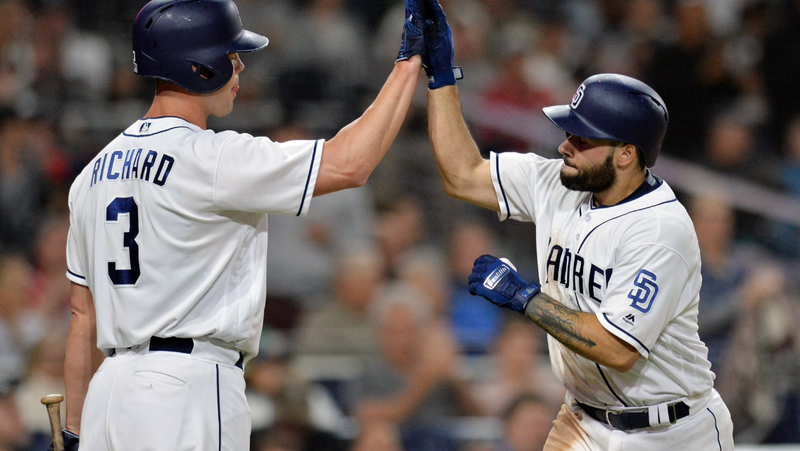 Freddie Freeman would hit a deep fly ball to center field, but Jankowski would flag it down on the warning track to end the game and give San Diego an 11-4 victory and a three-game win streak. With the MLB Draft occurring tonight, it is fun to look back on Drafts from years past. One that will intrigue Padres fans is the 1981 Draft, lovingly pointed out by announcers Don Orsillo and Mark Sweeney. Why the 1981 Draft? Because it was the same year current Padres announcer Mark Grant was drafted 10th overall by the San Francisco Giants. 48 picks later, the Padres would draft an outfielder named Tony Gwynn out of San Diego State. That’s right; Mark Grant was selected before Tony Gwynn. Orsillo and Sweeney had themselves a hearty chuckle after the former humorously voiced his disbelief at the fact. With his 2-4 game, Eric Hosmer pushed his batting average up to .293 and his OPS to .856. The first-baseman is now 16-31 for the homestand, good for a batting average of .516. Hosmer now has seven home runs to go along with 28 RBI while playing an exceptional first base, and he is certainly making his case to represent San Diego in Washington D.C. for the All-Star Game.